For over 75 years we have blended herbs and spices with fresh cuts of meat, and followed our time honored recipes, to create fine specialty and ethnic sausages. The Randolph Market label represents “Old-World Style” sausages. We use natural casings and the traditional flavors of fennel, basil, and garlic to enhance our sausage’s robust flavor and aroma. 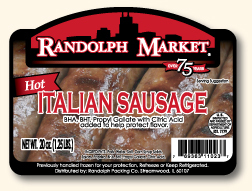 From traditional American pork sausage to ethnic Italian and Polish sausages to German bratwurst, the Randolph Market label delivers perfection in every package. Our sausages are blended and packed fresh in our federally inspected, USDA facility and delivered to you in links, rope or bulk. Fresh, smoked or fresh-frozen, our sausages represent a traditional standard for quality, ethnicity and flavor. Randolph Market mild Italian sausage combines Old World techniques, developed and brought overseas from Italy, with a mild traditional spice blend from one of Chicago’s famous ethnic neighborhoods. The Cracked Fennel in this sausage, along with the natural casing, create a true, “Old World” flavorful bite. Available in link, bulk, or rope. This sausage can be served in a bun as a sandwich, or used as an additional ingredient in recipes such as lasagna, spaghetti, and pizza. Suggested cooking techniques include: Grilling, Baking, Broiling, or Pan Frying. Randolph Market hot Italian sausage combines Old World techniques, developed and brought overseas from Italy, with a hot traditional spice blend from Chicago’s West side. It is the perfect combination of pepper in the spice blend and the natural casing that create the famous “Old World” bite. Available in link, bulk, or rope. This sausage can be served in a bun as a sandwich, or used as an additional ingredient in your favorite recipes. Suggested cooking techniques include: Grilling, Baking, Broiling or Pan Frying. Lakeside grilling and backyard cookouts have long been a favorite Midwest pastime. Randolph Market bratwurst, with their authentic Old World flavor, natural spices, and fresh cuts of lean meat, continue to be the bratwurst of choice for many self proclaimed “grill masters”. Available in links. This product is generally served hot off of the grill on a bun and accompanied with mustard, and sauerkraut. Lakeside grilling and backyard cookouts have long been a favorite Midwest pastime. 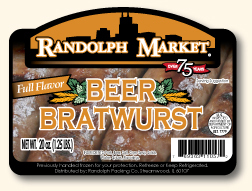 Randolph Market beer bratwurst, with their authentic Old World flavor, natural spices, fresh cuts of lean meat, and hint of beer, continue to be the bratwurst of choice for many self proclaimed “grill masters”. 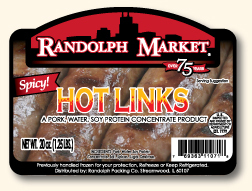 A Chi-Town favorite, Randolph Market Hot links are as hot as the big city during a mid summer heat wave. These all Pork links truly heat up the occasion. Available in links. This sausage is generally served in a bun as a sandwich, and sometimes accompanied with barbecue sauce and onions. One bite of this hot, juicy link and your mouth will burst with excitement. Our time honored recipe from one of Chicago’s Polish neighborhoods calls for using only fresh cuts of pork and a clever blend of spices. Available in link. This sausage can be served on a bun as a sandwich accompanied with mustard, onion, relish, and a pickle. It may also be served accompanied with potatoes and sauerkraut. 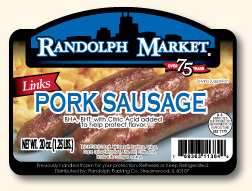 Randolph Market pork breakfast sausage is the sausage that makes the meal! The aroma of delicate spices such as sage and pepper, and lean cuts of fresh pork, cooking in the morning are sure to arouse your taste buds. 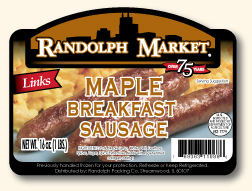 This breakfast sausage also gives you that sweet maple flavor bite after bite. Available in links. This sausage is traditionally served as a side for breakfast. Suggested cooking techniques include: Pan Frying or Baking. Randolph Market Pork breakfast sausage is the sausage that makes the meal. The aroma of delicate spices such as sage and pepper, and lean cuts of fresh pork, cooking early in the morning, are sure to arouse your taste buds. Available in link and bulk. This sausage is traditionally served as a side for breakfast. It can also be used in your favorite breakfast recipes that call for sausage. Whether tailgating with your family and friends, or just grilling up dinner at home, Randolph Market’s smoked bratwurst, with the finest of ingredients, is the link of choice. Available in links. This product is generally served on a bun. Suggested cooking techniques: Grilling, Pan Frying, and Baked. Want a little twist to your brat? Then Try Randolph Market’s smoked brat with cheddar cheese. Juicy, flavorful and robust, we have added rich cheddar cheese to our already delicious brat recipe. Ummm, delicious! For those who like their traditional Polish sausage, Randolph Market offers the robust taste of their smoked kielbasa. 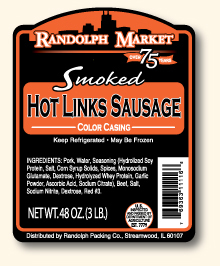 Using only natural casings, natural spices, and the finest cuts of pork and beef, this delicately smoked sausage takes you back to the “Old World”. Available in Rope. This traditional sausage can be served on a bun, as an appetizer, or perfect as an entrée. Suggested cooking techniques include: Grilling, Pan Frying, and Baked. Sweet and succulent, the flavor of maple oozes from this sausage. It’s hard to resist the pleasurable aroma of this unique sausage scenting the air. Available in Rope. This sausage is versatile in that it can be served at breakfast, lunch, and dinner. Randolph Market's smoked Andouille sausage uses a southern spice blend that is sure to excite the taste buds of even the most seasoned Cajun fans. Available in links. This sausage is generally served on a bun or in southern style stews. This hot link sausage is truly as hot as it looks. The heat for the sausage is provided by a clever balance of peppers and smoke. Available in links. This sausage is generally served on a bun. Lightly smoked and herb flecked, this sausage will entice your family and friends to the table every time. For a homey, unpretentious, honest meal, start with Randolph Market’s smoked sausage. Available Rope Style. This sausage is great at lunch or dinner. 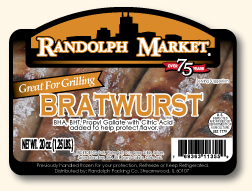 Our bratwurst are traditional German style sausages bursting with that famous Randolph Market bratwurst flavor. Conveniently precooked for quick preparation. Taste authentic.